I think everyone has their own definition of failure. My personal definition is when I don’t succeed at something that I tried to do (a friend of mine pointed out that I then need to define success, so we’ll say that success is when I meet my goals). By that personal definition, coming home early–not succeeding at staying out for the 18 months that was expected–was a failure. Not only did I came home early, but like I mentioned in a recent post, I also didn’t feel like I had made a difference in my seven and a half months in the mission field. I knew that it had done a lot of good for me, but I hadn’t gone on a mission to help myself. I was a problem missionary. Not by choice, but because of circumstance. That was incredibly frustrating to me. As you know if you’ve read my story, I became consumed with feelings of failure and had a rough time for a very long time. It took a long time for me to get over feeling like a failure for coming home early. When I was looking into going back in the beginning of last summer, I met with my bishop and we talked about it. He told me that I should know that I had served a honorable full-time mission and I didn’t need to go back to feel satisfied with that and the Lord was satisfied by that. Later on, someone said to me, “The Lord accepts your service as a missionary. Why can’t you?” After a few more of these experiences with other people talking to me about my experiences, as well as many personal experiences, I came to accept my mission and to be grateful for every second during the mission and during the healing process. Lately, however, the idea that I failed as a missionary came back very strongly. If you read last week’s post, you’ll probably know why. My sister came home from her mission. My sister was a very successful missionary in my eyes. She loved it. She knew from a very early age that she wanted to serve a mission. A mission was right in her element. When she would call us twice a year or in her emails, it was clear that other than a few normal hard times, she was happy. And that hurt. Because my mission, as wonderful as it was, wasn’t a particularly happy time in my life. And I was jealous of that. I started counting down the days until I saw her again 103 days before she came home. I think a few Facebook friends may have blocked me because of how frequently I posted about her coming home. I don’t think anyone could have been more excited to see her or prouder of her. But the Monday night before she came home, I hardly slept at all because I had nightmares all night about her coming home. I was so anxious the next morning that I threw up before I went to work. Suddenly, I was terrified. I knew I was in for a massive storm of I-came-home-early emotions. I didn’t want her to feel like she couldn’t be happy about her mission or that she couldn’t talk to me about it because of my experiences. At the same time, her mission was everything I desperately wanted my mission to be. My sister is amazing. She is always serving people and anticipating needs and taking care of people. And I’m not like that. I’ve always felt a little bit like she was the Celestial one and I was Terrestrial. And she made it for 18 months when I couldn’t. I spent Tuesday feeling nauseated and in tears. Wednesday night I didn’t sleep. Thursday I felt like I was going to throw up all over the airport. I was shaking while we waited for her to come. Sunday before her talk when I watched how many people were thrilled to see her and I saw the extended family pouring in to hear her talk, I cried. Because people hadn’t been excited to see me. They didn’t drive for hours to hear my talk. My homecoming was not happy. It was not a celebration. It was my family getting handed a broken kid who couldn’t cut it as a missionary. And it was hard. And I felt like a failure. During those sleepless nights, I felt the worst about myself that I ever have. I felt upset that I was so upset about her coming home and her great accomplishments in her time serving the Lord. But her mission was everything I desperately wanted mine to be. I thought I had taken care of most of my healing before then, but those wounds came back just as strong as they had ever been during all of this. In the month since she’s been home, I’ve thought a lot about failure, in particular with how it relates to coming home early from a mission. According to the research done by Kris Doty at UVU about early returned missionaries, 73% of ERMs have feelings of failure. That’s a high percentage. But it’s not surprising. For our whole lives, we knew that a mission was either two years or eighteen months. We knew that a mission was supposed to be the “best two years”. It is hard to understand how important that amount of time becomes unless you suddenly have that time cut shorter than you expected. Everyone expects you back at a specific time. Coming home early feels like quitting. I’ve had a lot of discussions about failure with friends lately. On our way to a ward trip, I discussed it with my trainer from the mission and a few other friends. It never ceases to amaze me that the person most likely to consider my mission a failure is always me. Of course there have been other people who have said unkind things, but I’m always the one that it is hardest to convince. In the discussions I had with my friends, we talked about why the concept of failure is so prevalent and so dangerous. The thing is, if you convince yourself that you are a failure, you automatically will be. If you think you are a failure, you aren’t going to try anymore. And when you don’t try anymore, you aren’t going to end up in the place you want to be in the end. When I considered myself a failure, I didn’t want to go to church. I stopped praying. I stopped trying to improve myself and become a better person. I didn’t need to try if I had already failed permanently, the way I felt I had. That’s why failure is so dangerous. Considering yourself a failure puts a barrier between you and the atonement. Jesus Christ is willing and anxious to help us, but we have to let Him. I think it is interesting how many times people in the scriptures or modern days struggle but are immediately given help when they ask for it. I think of my experience when I finally hit rock bottom and I pled for help for the last time, allowing light to flood back into my life. I think of Peter walking on the water. When he started to struggle, he called out for help and Jesus was there immediately (Matthew 14:30-31). Christ is there to help us, but if we are so consumed with feelings of failure, we can’t accept His help. If you are struggling with feelings of failure, think of how Heavenly Father feels about your mission. Do you think that he thinks your mission as a failure? Do you think he sees you as a failure? I don’t believe that He created any of us as failures. And I don’t think He sees the things we see as failures. He gives us opportunities to learn and grow, and sometimes those opportunities we will not be perfect in handling. In His eyes, we cannot fail as long as we are trying to get better and become more like our Father. He will not let us fail permanently if we are trying to do His will. Even if we have gone against His will in some area of our lives, He will be there to help us fix our mistakes. That is what the Atonement is all about. When I think of my mission, I often think of it as a failure. But when I look at what has happened to me as a result of that, I have to realize that coming home early was the best thing to ever happen to me. Coming home early taught me important lessons about the atonement that I couldn’t have learned in another way. It has changed my entire perspective on life in a good way. Before my mission I had never been that happy of a person. Coping with those feelings of failure and depression after I came home taught me how to be happy. This blog has giving me the opportunity to talk to other early returned missionaries and help them understand that they are not failures has been an incredible success that came from that failure. Almost everything good in my life right now I can attribute to coming home early from my mission. 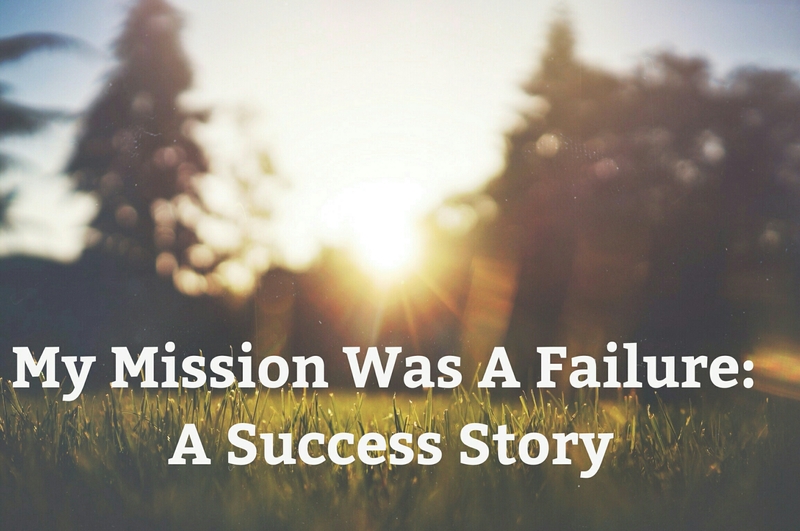 My mission was the best failure of my life because it allowed me to find success in so many other things.